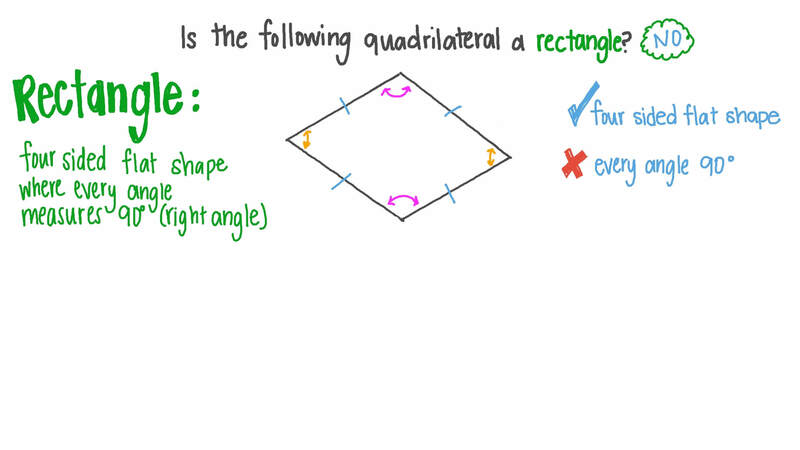 In this lesson, we will learn how to classify quadrilaterals according to their sides’ and angles’ relationships. Is the following quadrilateral a rectangle? Is this quadrilateral a rhombus? What is common between the following shapes? B All shapes are equilateral. CAll shapes contain right angles. DAll shapes contain one pair of equal sides. E All shapes contain perpendicular sides. What is the name of this quadrilateral? Which of the following labels the given quadrilateral? Select the shape that has four right angles. Is the following quadrilateral a rhombus? Is the following quadrilateral a square? Is this quadrilateral a rectangle? Is this quadrilateral a square? Identify the list all of whose members share the property that each pair of their opposite sides are parallel. Which list consists of quadrilaterals with the property that, on each, the pairs of opposite sides have equal length? 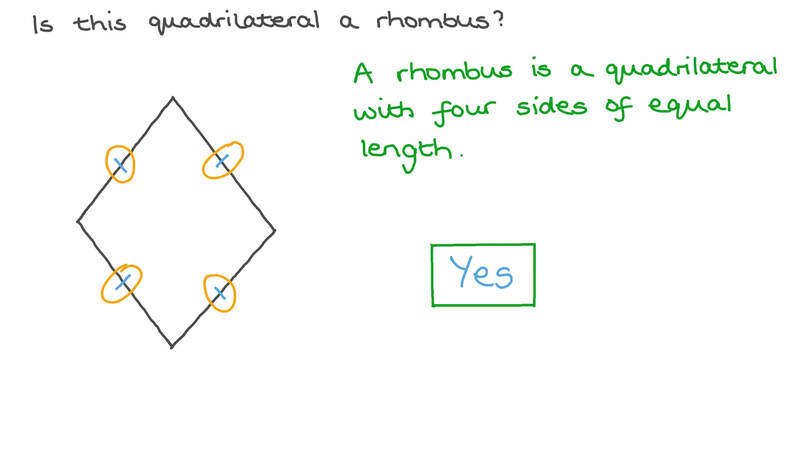 Which of the following statements about a rhombus is true? AIt is a parallelogram with all sides of equal length. BIt is a regular polygon. CIt is a quadrilateral with 4 pairs of perpendicular sides. DIt is a quadrilateral with 4 angles equal in measure. EIt is a quadrilateral with only 2 sides equal in length. 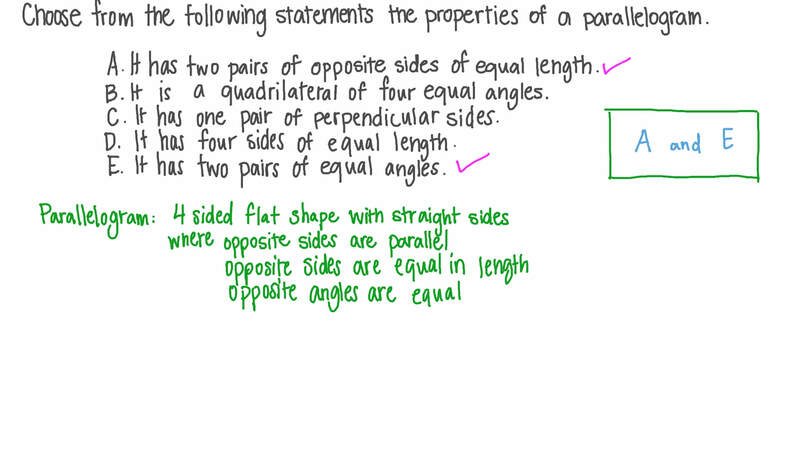 Choose from the following statements the properties of a parallelogram. It has two pairs of opposite sides of equal length. It is a quadrilateral of four equal angles. It has one pair of perpendicular sides. It has four sides of equal length. It has two pairs of equal angles. Name two quadrilaterals whose 4 sides all have the same length. Sherif and his brother are building a tree house. It will have 2 windows. One window is shaped like a square, and the other is shaped like a rectangle. What do these two figures have in common? Fady draws a quadrilateral that has 4 equal sides but no right angles. What quadrilateral might it be? State which of these quadrilaterals must have four congruent sides: square, rectangle, trapezoid, rhombus, parallelogram.